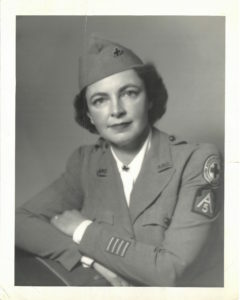 Bumpy in her Red Cross uniform. Source: Subgroup II. Eleanor B. Stevenson papers, Series 6. Photographs, Box 2. Stevenson Papers, RG 30/219, O.C.A. Eleanor Bumstead Stevenson, known as “Bumpy” to her friends and family, was born to Henry Andrews Bumstead and Luetta Ullrich Bumstead on 9 March 1902. She was raised in New Haven, Connecticut, where her father was the Chair of the Physics Department at Yale University. Stevenson attended Rosemary Hall boarding school in Greenwich, Connecticut, and in 1923, she graduated from Smith College with a Bachelor’s Degree in English. In 1924, Eleanor met William (Bill) Stevenson, a graduate of Princeton University who was then studying in Oxford as a Rhodes scholar. Two years later, in January of 1926, they were married and lived in New York, where Bill worked as a lawyer. The couple had two children, Helen Day, born in 1928 and Priscilla, born in 1929. Bumpy especially is a sponge that attracts the spilling of private griefs. The soldiers think she is wonderful. She is always getting herself into a mess by going to bat for somebody she thinks is being mistreated… She travels a lot, and everywhere she goes she lends her pretty ear to tales of woe, turns her pretty smile on generals and privates without distinction, and gives her strong shoulder to be wept upon by all and sundry. World War II was an important moment for women who participated in the war effort. Like many of her contemporaries, Eleanor had war experiences that shaped her opinions for the rest of her life. In 1945 Eleanor published a book, I Knew Your Soldier, which detailed her experiences with the Red Cross and the lives of the young men she treated in the field. This book and all her later writings on the subject, show how the war was essential in inspiring Eleanor’s commitment to improve the world around her. The horrors of war drove her not only to advocate for peace, but also to attempt to build a better world so that the sacrifices of so many soldiers would not be in vain. She felt that the only way to repay these soldiers for their suffering was to use the freedom they had helped preserve to make the world as close to a utopia as it could be. After the war was over and they had returned to the States, Bill and Eleanor embarked on another adventure together, this time at Oberlin College. Bill became the college’s president in 1946, and remained in that post for over a decade. During his presidency the enrollment of foreign students increased, East Asian Studies and Judaic Studies were added, and the Department of Religion returned. Faculty salaries, which had been stagnant since the Great Depression, were increased, and the first black faculty member, Wade Ellis, was tenured. In 1969, Eleanor and William were the first “team” to be awarded the Alumni Medal for their service to Oberlin College. It was this teamwork which allowed Bill and Eleanor to accomplish so much while at Oberlin. While Bill and Eleanor were both involved in the day to day running of the college, Eleanor used her free time to become a traveling lecturer and a staunch advocate for women’s education, veterans, and civil rights. Like her namefellow Eleanor Roosevelt, Eleanor Stevenson made use of her position as a first lady of sorts to create a platform for her causes. As Susan Ware wrote, Roosevelt was attracted to building a “more interesting and fulfilling life as a political wife than as a conventional society matron.” While neither Eleanor entirely rejected their traditional feminine duties, they constantly sought to move beyond them. No course that I took at Oberlin in 1947 was as educating as having “Bumpy” Stevenson, the wife of the college president, join me in trips to Columbus to try to pressure the Ohio Legislature to pass a fair employment practices law….Stevenson, others from Oberlin and I staged a sit-in at the Neil House Hotel in Columbus after our group was denied service in the dining room because I, a black person, was in the group. Eleanor also continued her Red Cross work at Oberlin, visiting veterans’ hospitals with students on the weekends. In typical “Bumpy” fashion, she entertained faculty and students alike, creating a welcoming environment in her own home; an Oberlin Review headline from December 20, 1946 reads, “Stevensons Will Entertain Entire Student Body.” In 1959, after many years of fulfilling work, the Stevensons decided to leave Oberlin in order to pursue new opportunities. These new opportunities were not slow in arriving, and the Stevensons spent most of their next years working abroad. In 1960, Eleanor and Bill traveled to the Middle East, where Bill served as Chairman of a Commission to Survey American higher education in the region. Then, in 1961 they were presented with a new challenge: President Kennedy appointed Bill as Ambassador to the Philippines. Much like at Oberlin, the Stevensons considered this a joint venture. While Bill was overseeing his duties as ambassador, Eleanor was helping run the embassy, studying Filipino culture and history, and forming ties to the local community. In particular, Eleanor made bonds with many of the local women’s groups. At this point in her life, she focused many of her efforts on promoting the education of women, something that resonated with many of the concerns of Filipino women. The Stevensons left the Philippines in 1964 after serving with distinction. They then returned to the United States, where the spent the rest of their lives continuing to serve their community and nation in various ways. Alongside her lifetime of activism and entertaining, Eleanor sat on several boards including the Board of the American University in Cairo, the Board of the Fund for the Republic, the Board of the Music Associates of Aspen, and the Center for the Study of Democratic Institutions. Eleanor Stevenson lead a colorful life, marked by her engagement with the communities in which she lived. She heeded the call of the war effort, going to where she was needed most–right in the thick of things, on the battlefield. “Bumpy” also worked hard on her return to the United States giving talks to women’s groups across the country on the role of women in society, modestly pushing for a more equitable life for American women, the nation’s “secret weapon.” At Oberlin she led a busy life, constantly entertaining and administrating, and actively working in the civil rights movement. Her commitment to creating a more peaceful world is clear from the documents within this mini-edition. Stevenson carried with her a sense of duty towards her community everywhere she lived, from Algeria to Oberlin to Manila, and listened to the needs of those around her, always pushing towards utopia. From a feminist perspective, Eleanor Stevenson’s advocacy work and her commitment to this utopian ideal is based on several facets. The first is a clear recognition of the problems of the world and of the need for action. Eleanor was not one to simply make speeches, but to advocate consistently for legislation and services which would have a concrete impact. While she certainly felt that spreading awareness of social problems was important, her advocacy work always pushed beyond simply spreading awareness, into offering actionable solutions or remedies for the problems she saw. The second facet is what might today be called a sort of proto-intersectionality. Eleanor was cognizant of systems of oppression, particularly based on race and gender, and while she never explicitly connected these systems of oppression or dealt with the way they overlapped, her staunch advocacy for both civil rights and women’s rights is telling. To Eleanor, it was clear that her vision of utopia involved all groups of people, not just those groups to which she herself belonged. While her advocacy was far from perfectly intersectional and had many gaps (for instance, she never discussed class), this commitment to a utopian vision that at least made an attempt to included all people is important. The third facet of Eleanor’s advocacy work is her omnipresent gender essentialism. While Eleanor never believed that women should be confined to traditionally female roles, she always underscored the importance of those roles, particularly within the home, and how these roles could only be truly fulfilled by women. Eleanor Stevenson spoke about motherhood as the fundamental role of women; “women are largely responsible for the molding and the development of children,” she wrote in a draft of a letter transcribed in this set of documents. She espoused the continuing education and even careers of mothers, but always affirmed their responsibilities as primary caregivers and as the center of the home. To Eleanor, women’s basic nature was different from that of men, even though their intellectual capabilities were the same. Women, to Eleanor Stevenson, were the nurturers and peace-bringers. Though she did not use the term “feminist” to describe herself, Eleanor consistently advocated for the further equality of women in society. This was not only because she felt that women were the intellectual, and even physical, equals of men, but also because she felt that her vision of a utopian society required the equal presence of women. Her gender essentialism went hand-in-hand with her utopian vision: a better world was possible through the empowerment of women because women were the nurturers, the caregivers, and the peace-bringers. If women were empowered they would be able to control the violent tendencies of men which led to warfare. If women were empowered, they would care for those that a patriarchal society ignored. If women were empowered they would be able to bridge the gaps caused by race, nationality, and ethnicity through their empathy and understanding. Eleanor’s long partnership with Bill gave her the perfect basis on which to build her better world: men and women, in complementary and loving partnership. The documents within this mini-edition are organized to show the development of Eleanor’s utopian vision and the growth of her advocacy work through that vision. The first three documents, a diary entry and two letters, show her early views on love and marriage, and development of the relationship with Bill that would influence the rest of her life. The next document, an excerpt from her book I Knew Your Soldier, reveals both Eleanor’s experiences during the war, and some of the ways in which her gender essentialism could unfortunately limit her ability to fully advocate for women, particularly those who neglected their duties as nurturers and caregivers. The next three documents, two speeches and a letter, deal with her advocacy work while at Oberlin, particularly her continued commitment to veterans, and her emphasis on the importance of civil rights. This mini- edition then focuses on her advocacy and work while in the Philippines and includes three of her own speeches, showing both her hospitality and her commitment to women’s education, as well as a complementary speech on women’s education by Helena Benitez, one of the Filipino women Eleanor worked with. The final document is a letter of condolence sent to Eleanor’s daughter Priscilla after Eleanor’s death, providing a final reminder of the impact Eleanor Stevenson had on the lives of so many people. While Eleanor Stevenson’s advocacy work was not perfect, she can serve as an example of both the drive, and the limitations, of many white Second Wave feminists, particularly those in the early part of the movement. Though her gender essentialist views could serve as limitations to the empowerment of women as much as they could serve as a means of empowerment, Eleanor was hardly alone in her thinking, which was in many ways a product of her time. As she said herself, “we cannot change the world, but we can change the people in it.” Despite her limitations, Eleanor Stevenson’s work and outreach certainly did bring her vision of utopia a little closer to reality. While she might not have been radical enough to transform the world, she certainly changed the lives of many people in it. Eleanor Stevenson and Pete Martin, I Knew Your Soldier (New York: Penguin Books, 1945), 3-17. Subgroup II. Eleanor B. Stevenson papers, Series 4. Honors and Miscellaneous Personal Papers, Box 1. RG 30/291. O.C.A. Dorothy Sue Cobble, “When Feminism Had Class,” in What’s Class Got to Do with It? : American Society in the Twenty-first Century, ed. Michael Zweig (Ithaca, NY: ILR Press, 2004), 25. Susan Ware, Letter to the World: Seven Women Who Shaped the American Century (New York: W.W. Norton and Co., 1998), 11. See document 7 for more details (“Obituaries and Letters of Condolence” Subgroup II. Eleanor B. Stevenson papers, Series 4. Honors and Miscellaneous Personal Papers, Box 1. William and Eleanor Stevenson Papers, RG 30/219. O.C.A.). “Stevensons Will Entertain Entire Student Body,” Oberlin Review, 20 December 1946.